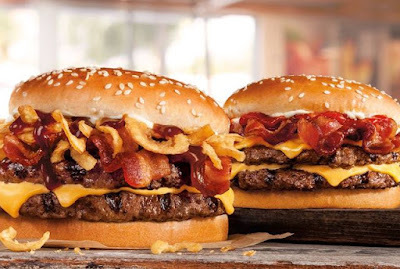 Burger King gives the Bacon King some company, at least for a little while, with the limited-time release of the new Steakhouse King. The sandwich features two quarter-pound flame-grilled beef patties (AKA Whopper patties), 3 half-strips of thick-cut bacon, A.1. Thick & Hearty sauce, crispy onions, melted American cheese, and mayo on a sesame seed bun. If the combination seems a bit familiar, A.1. steak sauce and the "Steakhouse" name have made several appearances on the BK menu in the past. The Steakhouse King isn't much different from the A.1. Ultimate Cheeseburger from back in 2014. You can expect the new burger to cost between $5 and $6 (may vary).